Heat oven to 350°F. Unroll dough on work surface; pinch seams to seal. Press or roll out dough into 16x8-inch rectangle. Cut into 8 (4-inch) squares. Press 1 square in bottom and up side of each of 8 ungreased regular-size muffin cups. In food processor with metal blade, place almonds and 1/4 cup white chocolate baking chips. Cover; process using quick on-and-off motions until coarsely chopped. Add butter, sugar, almond extract, eggs and coconut; process until well blended. 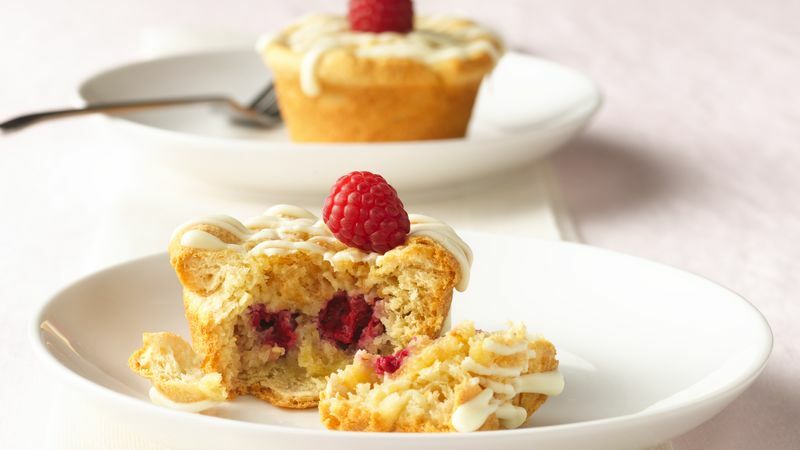 Place 2 raspberries in centre of each dough-lined muffin cup (reserve remaining berries for garnish). Spoon about 2 tablespoons almond mixture onto raspberries in each. Bake 16 to 20 minutes or until golden brown. Cool 5 minutes. Remove from muffin cups. In small microwavable bowl, microwave drizzle ingredients uncovered on High 30 to 60 seconds, stirring every 15 seconds, until melted. Drizzle onto cups; top each with 1 raspberry. Serve warm. *To toast almonds, heat oven to 350°F. Spread almonds in ungreased shallow pan. Bake uncovered 8 to 10 minutes, stirring occasionally, until golden brown. Kitchen Tips Substitute semisweet chocolate chips for white chocolate baking chips. Don’t care for coconut? Feel free to omit it in this recipe!